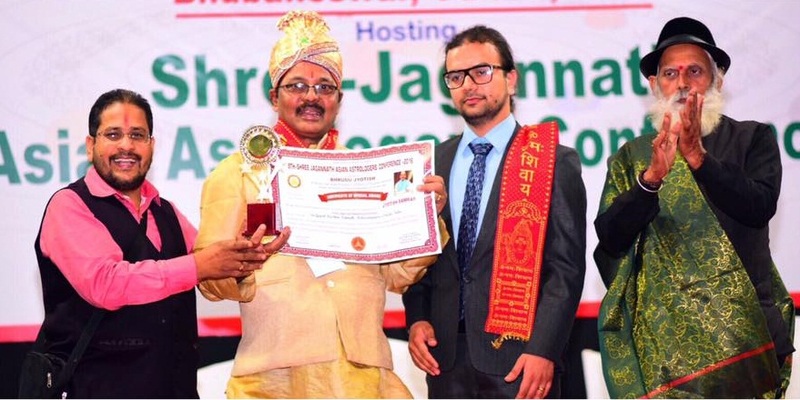 Nabarangpur-Online: Astrologer Gopal Patnaik felicitated with Jyotish Samrat. Astrologer Gopal Patnaik felicitated with Jyotish Samrat. Well-known astrologer Gopal Patnaik, of Nabarangpur felicitated with Prestigious “Jyotish Samrat” at the 9th Asian Astrologers Meet held at Institute of engineers’ bhawan of Bhubaneswar. The conference which recognises research scholars in astrology, palmistry, numerology, and vaastu and hold special discussions on the issue. Over 200 astrologers, including delegates from India, Nepal, Bangladesh, were participated in the conference. Astrologers were felicitated with awards for their outstanding contribution in the field of astrology. Engineer in Chief Bijan Kumar Behera was the chief guest while founder of Bhrugu Jyotish Pandit Sridhar Acharya, coordinated the seminar.